The SDRplay RSP is a $149 USD software defined radio that many consider as a next step upgrade from the RTL-SDR. See our recent review for a comparison between the Airspy, SDRplay RSP and HackRF. Copper tape shielding for the RSP. 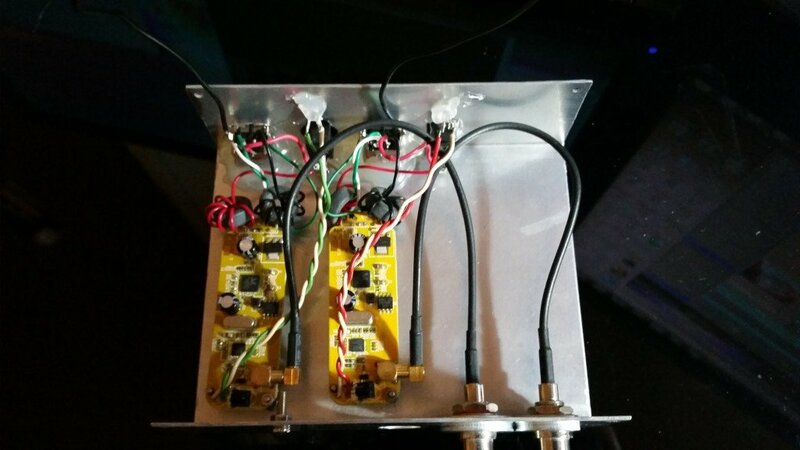 After shielding the RSP, Tom tested the shielding effectiveness by using his shielded RSP with no antenna connected to try and pick up an interfering tone transmitted by his HackRF SDR. He collected the results in a pdf file. The results clearly show that the shielded RSP does not pick up, or significantly reduces the power of the HackRF’s interfering tone. If you want to try this yourself, Tom writes that this copper slug barrier tape found on eBay is the tape he used. Tom also points out the discussion on the Facebook SDRplay group thread he posted where other users have been using aluminium tape or alternative copper tape products. We note that this same shielding technique can also be used to improve unshielded RTL-SDR dongles. Over on his blog, Twitch has uploaded a post showing how he mounted two RTL-SDR dongles into a single metal case in order to reduce noise. Twitch used a $2 aluminium metal case that he obtained from a local surplus shop and cut it down to size and added holes for switches and BNC plugs. He then mounted two RTL-SDR dongles in the case and used two MCX -> BNC pigtails to get a case mounted coax connector. He also removed the USB plugs on the RTL-SDR’s and wired them into a USB B plug mounted to the case, making sure to wind the USB power cables through several turns of ferrite core in order to reduce USB noise. Finally he also added a power switch to the USB connections, to be able to easily power off the units when not in use. 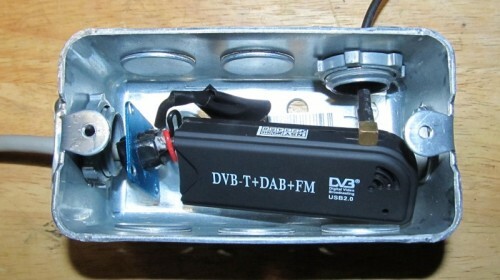 The two RTL-SDR’s placed into a aluminium case. Over on YouTube user Cameron Conover has uploaded a video where he tests the effectiveness of the optional HackRF RF shield and also shows how to install it. The shield solders on to the RF front end of the HackRF and is intended to block signals from entering the device other than through the antenna. To test the effectiveness of the shield Cameron uses a signal generator to transmit a test signal at 406 MHz. He shows that without the shield in place the HackRF with a 50 Ohm terminator on the antenna input strongly picks up the test signal. After soldering in the shield and testing again, the test signal can no longer be picked up. It is a good idea to make sure that both the SMA connector and the USB screen have a good electrical contact with the box. Grounding only the USB screen causes a severe degradation of the NF. The findings here may also be useful for improving shielded RTL-SDR dongles. A few weeks ago we posted about will1384 who had bought an aluminium case from Ebay and was using it to shield his RTL-SDR. After running multiple tests, will1384 discovered that the aluminium case was actually not helping with shielding performance at all. Oddly his results showed that the aluminium case was actually increasing the amount of noise received. Will has been updating his imgur album with noise analysis results from rtl_power scans over the entire spectrum. In his latest tests he tried a metal outlet box as the case and saw improved results over the aluminium case. His conclusions seem to indicate that the aluminium box is not a good EMI shield. 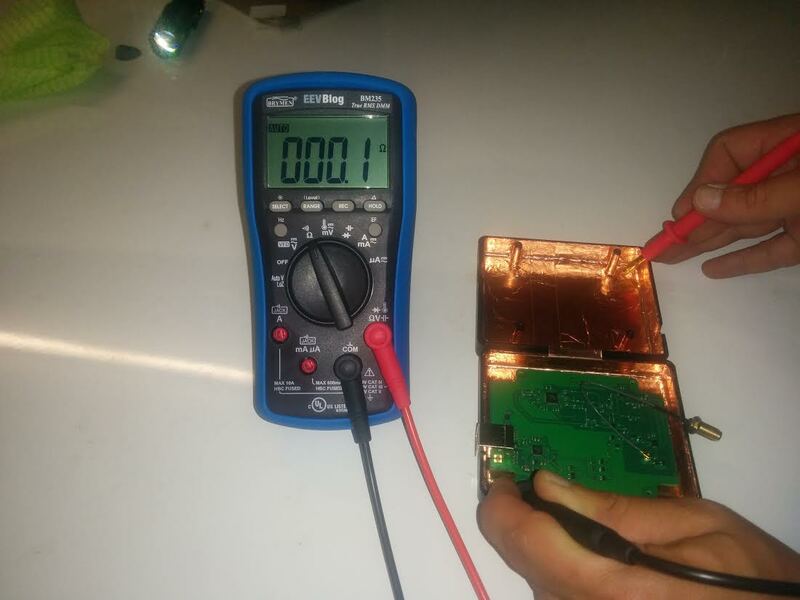 We’re not sure why he found these results, but one theory might be that because the aluminium case is anodized, it has a non-conductive surface, which might cause poor grounding. 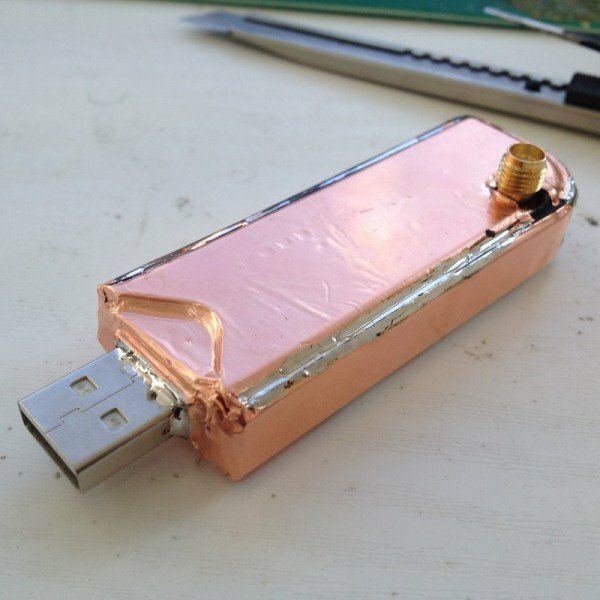 Last month we posted about an RTL-SDR experimenter who shielded his RTL-SDR dongle using an aluminium case. Shielding the RTL-SDR helps to reduce out of band interference which can enter the device through the PCB itself. Now Melih, another RTL-SDR experimenter has recently posted on his blog about his simpler shielding method that uses cheap copper tape. The copper tape was purchased from ebay, and is the type that is commonly used for creating a slug barrier in the garden. Over on the Reddit thread discussing his work, there are some concerns about excessive crystal drift due to there being no ventilation holes. However, it seems that the general consensus is that lack of ventilation will not significantly affect crystal drift and may actually help to stabilise the crystal over time by keeping the internal temperature more constant. You may also be interested in Melih’s previous post where he replaces the MCX connector on the dongle with an SMA female connector. Over on Reddit user will1384 has posted about his imgur photo album that clearly documents some well researched steps that he took in an effort to shield the RTL-SDR dongle from interference. Interference is caused by strong out of band signals that can sometimes show up even when no antenna is connected to the dongle. Shielding the dongle helps to remove this interference. Buy an aluminium case from ebay and put the dongle inside it. Remove the USB connector and ground the dongle ground to the aluminium casing using a 1M Ohm resistor and a 47nf ceramic disk capacitor. Connect the USB data lines to a USB extension cable and wrap a toroid around the 5v and GND lines and twist the two data lines together. There is a discussion about this shielding project on Reddit. Over on YouTube Adam, the creator of the LNA4ALL, LNA4HF and UP100 upconverter has uploaded a video showing that the noise that is produced by the RTL-SDR dongle itself can degrade performance when combined with an LNA and/or upconverter. Most commonly we’ve seen people mount the RTL-SDR dongle together with an upconverter and/or LNA in the same shielded box right next to each other. However, these results show that the RTL-SDR should be shielded separately from the LNA and upconverter for best performance.